On the flipside, I’ve ridden through shattered neighborhoods where a caring resident or two live in perfectly maintained, well landscaped homes worthy of those found in suburbia’s best communities. 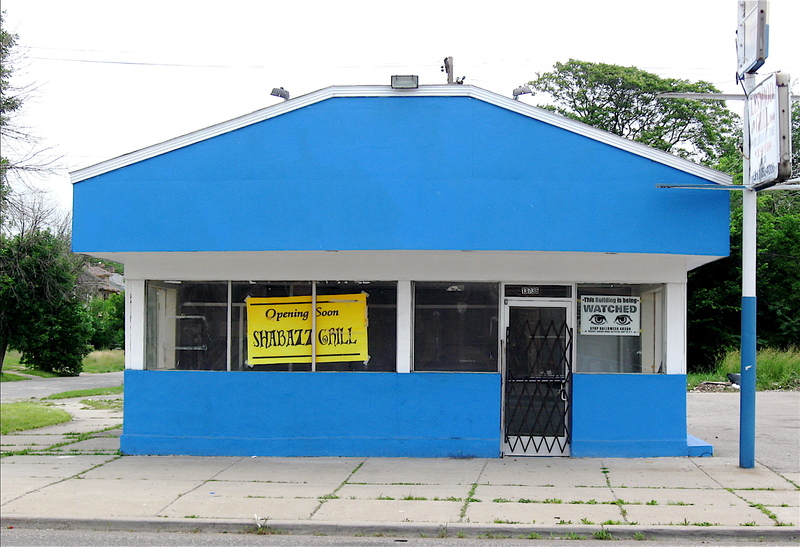 I have been in neighborhoods, such as Southwest Detroit, where there’s a hornet’s nest of activity with bumper-to-bumper traffic, packed restaurants and coffee shops. The downtown area and the lengthy riverwalk are usually bustling, and so is Detroit’s midtown area with its vibrant restaurants, brewpubs and cultural institutions. Plus, there are pockets of new housing projects developed by Habitat for Humanity and other citywide non-profit organizations. 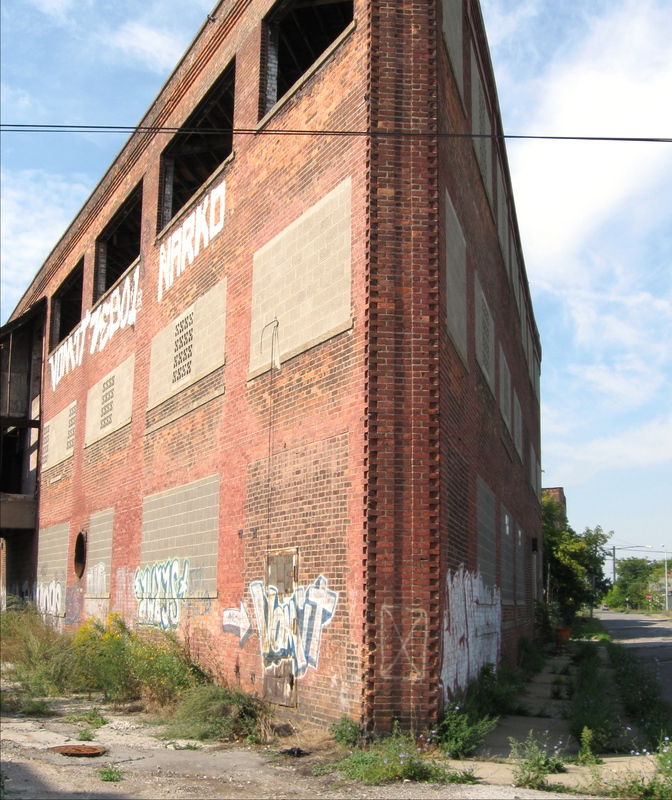 As this blog reflects, there is quite a contrast in what I see pedaling across Detroit. One of the things I’ve noticed in this large city full of oddities and contrasts is that there is no shortage of unusual, odd buildings. 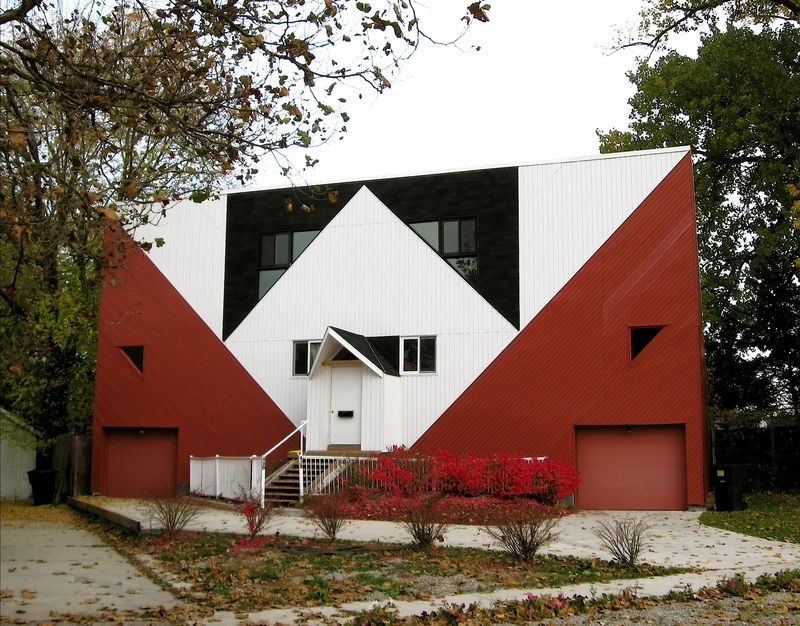 They seem to come in all shapes and sizes; built out of brick, wood, cinder blocks or a combination of all. Several are residential places that have been added on to over the years without any regard, it seems, for building codes. 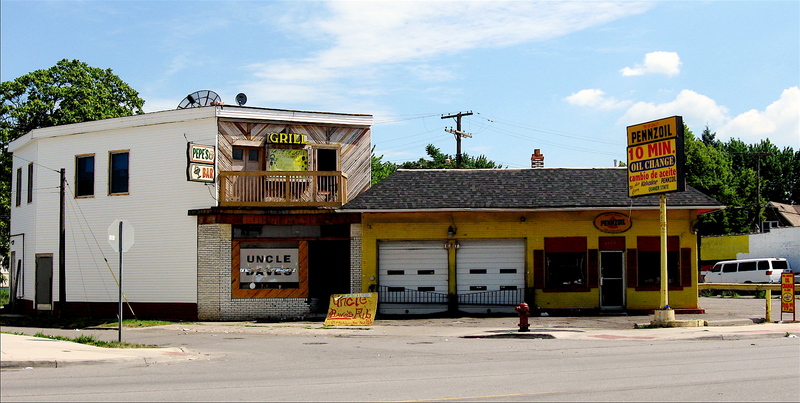 Others are small commercial buildings that have outlived their original use as a neighborhood mom-and-pop store and are now painted in bright, wild colors. A few I’ve seen have been built at peculiar angles to fit on a sliver of land that was only available during the time it was constructed. The older sections of the city seem to have a quite a mixture of odd buildings. I’m not sure if it was the era in which they were built, or perhaps they’ve evolved over decades of use and updates by different owners. 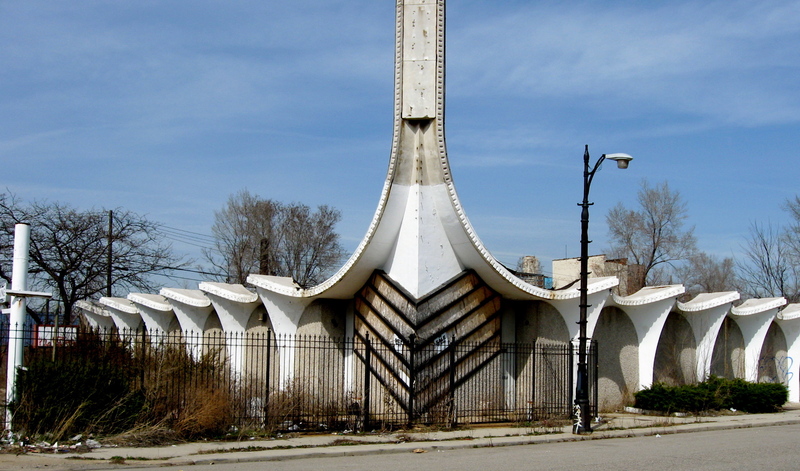 Regardless, Detroit is packed full of odd buildings. 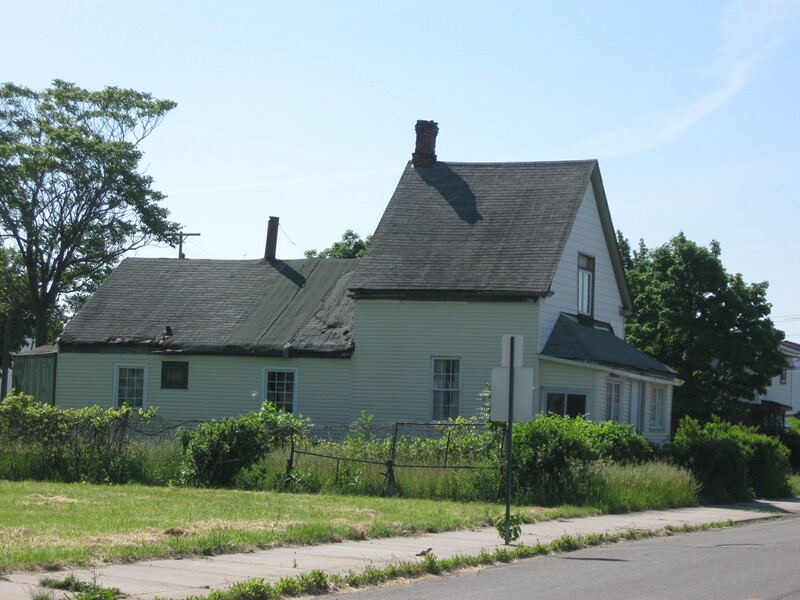 Detroit neighborhoods can be a relaxing and calm environment. There are plenty of streets with vacant lots that have reverted to fields of tall grass, much like prairies found in the open country. The inner city green spaces that have replaced once vibrant communities offer a pleasant, serene natural world setting as compared to the area’s rough, urban surroundings. 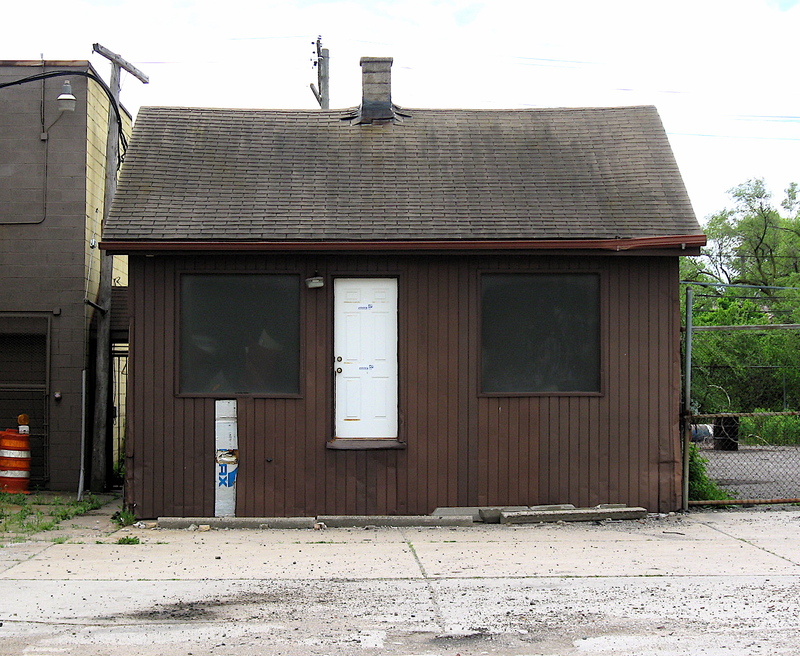 There are plenty of people still living in many of the thinly populated areas of the city. 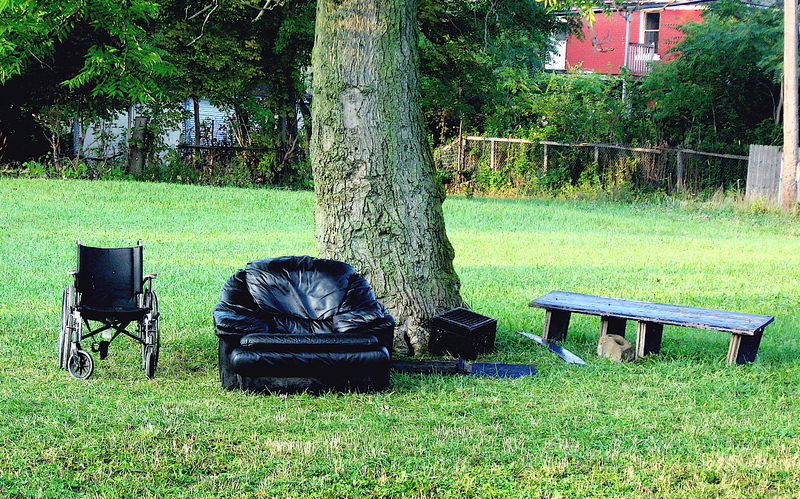 A few have adopted sections of the overgrown, green spaces in their immediate area and turned them into an unofficial gathering place. They appear to be comfortable places, with some spaces carved out in a shadow of a tall Maple tree. On warm days in a few of the areas, barbecue smoke fills the air. Sometimes unknown beverage bottles, wrapped in brown paper bags, are passed among friends as they talk, laugh and maybe take part in a tense game of chess. I’ve even witnessed a game or two of horseshoes while riding past the makeshift parks, and have heard the steel shoes clang against a metal spike after a carefully, calculated toss. 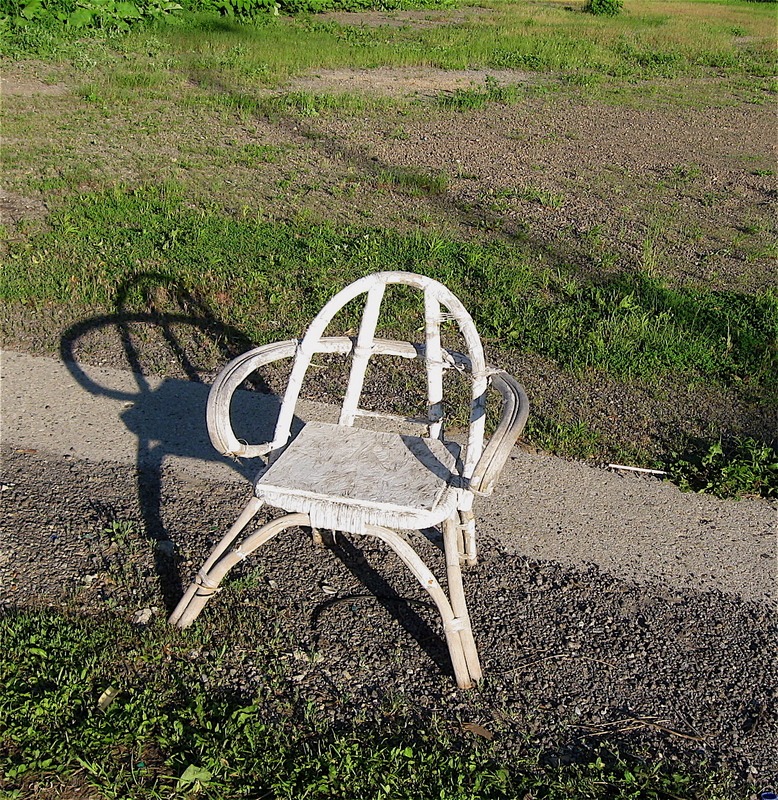 As expected, a variety of lawn furniture can be found in these little islands of serenity where time seems to slow down. Much of the furniture I see isn’t the typical white, plastic molded table with matching chairs. It’s also not the usual lightweight, fold-down aluminum chairs found at a discount department store or local hardware. 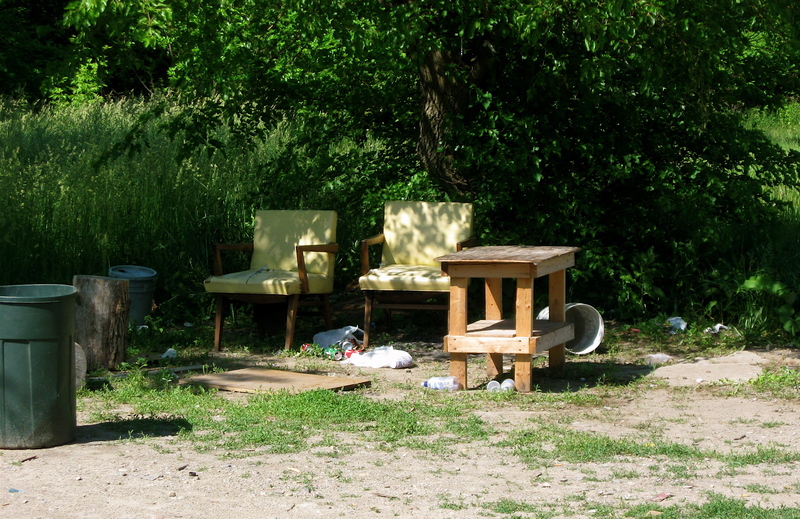 The furniture I normally see while pedaling by these little neighborhood-gathering places is rather unusual. 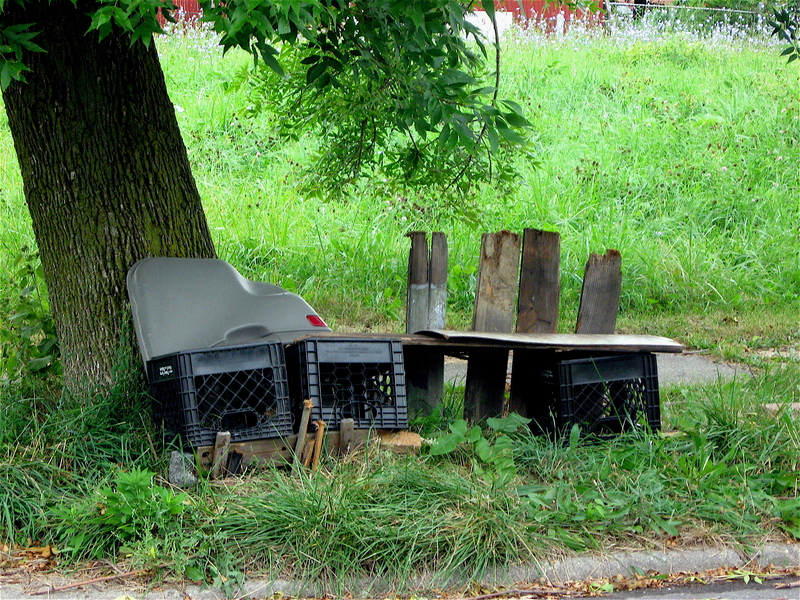 The outdoor furniture I spot is constructed from a variety of materials such as scrap wood, blue milk crates, plastic pails, discarded tires and other salvaged items such as logs. I’ve also come across abandoned wheel chairs, over-stuffed leather chairs, sofas and other cast offs that may have been plucked from a trash heap somewhere close by. 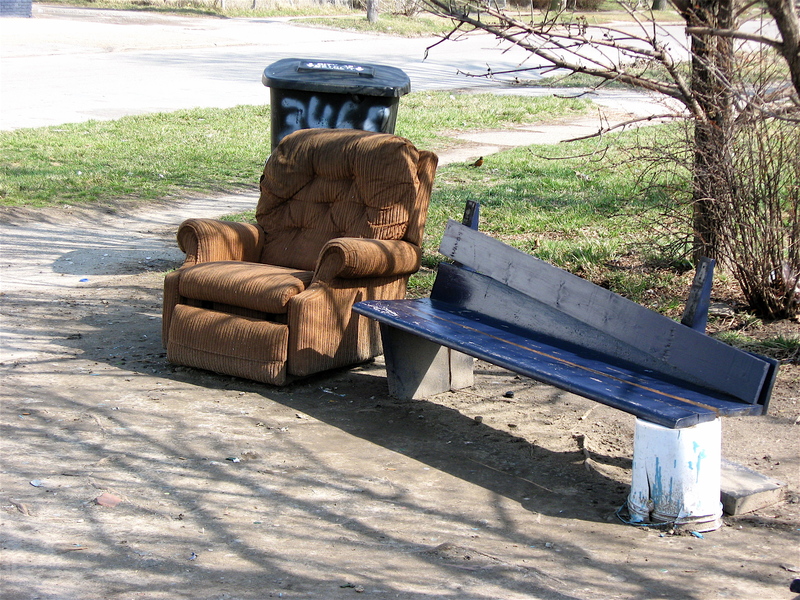 Despite the rough physical appearance, the cobbled together furniture appears to be quite functional and works well for those gathered in Detroit’s little pockets of tranquility. 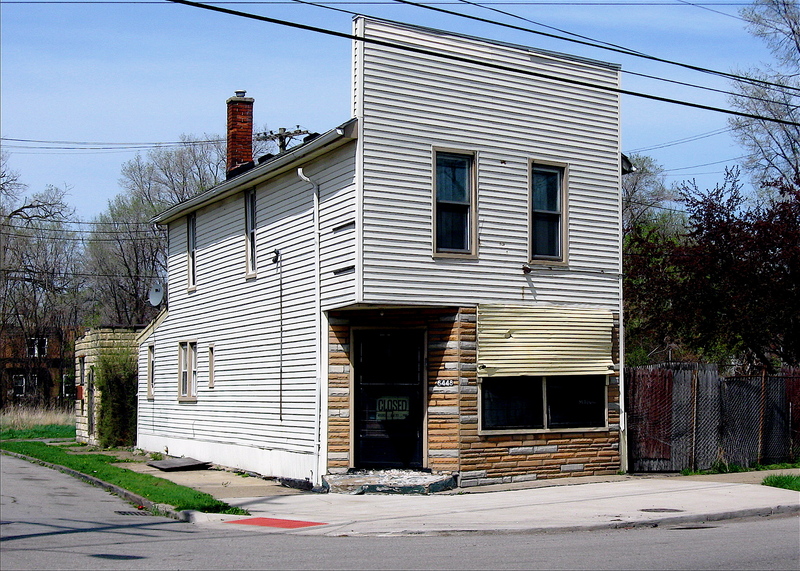 On my two-wheeled rides across the city of Detroit, I see buildings painted in interesting ways. Many are quite crude in their design and execution. Some are not, and have well-identified images of liquor bottles, fruit, vegetables or jumping fish. Others advertise check-cashing and money order services using large, colorful letters. I’ve also ridden past buildings with detailed paintings of trains and cars, as well as appliances, mattresses and other household items. There is also quite a variety of colorful graffiti, quirky sayings and bold graphics, such as contrasting lines and arrows that decorate many buildings. All are designed to grab the attention of those passing by. 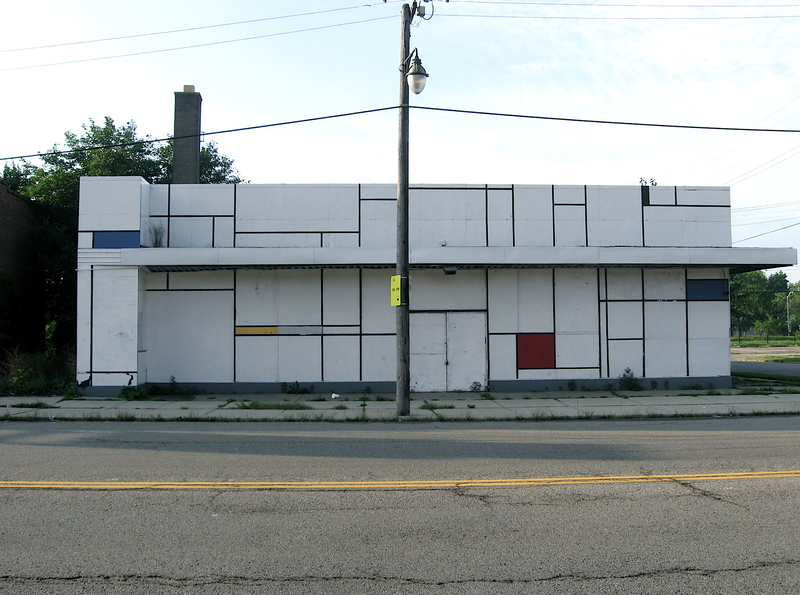 After thinking about it, I came to the conclusion that the building’s simplistic paint job is based on the work of a Dutch painter named Piet Mondrian. 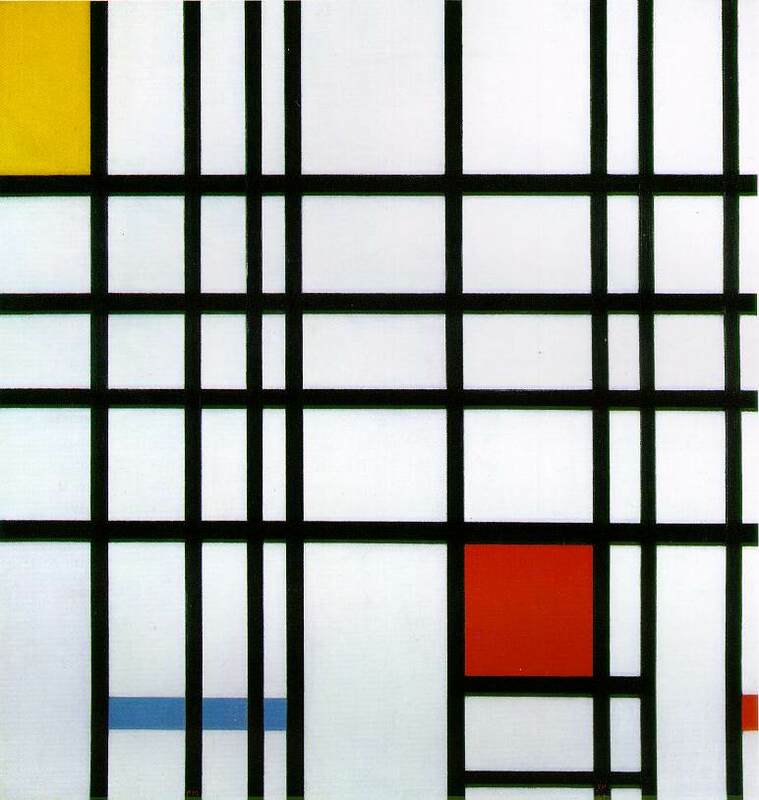 Mondrian became famous in the 1920s for his stark white paintings incorporating simple black lines and colored boxes, most notably one produced in 1921 titled Composition with Red, Yellow and Blue. Whoever designed the graphic look and painted the low, wide horizontal building in this fashion had an excellent grasp of art history and picked the perfect palette. I never would have anticipated seeing a building painted in this artistic style while riding my bike on a desolate stretch of Harper Avenue in Detroit. Near the intersection of Trumbull Street and the I-94 expressway in Detroit is a field. This particular field butts up to a series of railroad lines that are part of an intricate system of tracks that crisscross the City of Detroit. Like many fields and empty lots scattered throughout the city, this lonely piece of land is full of weeds and small trees and is located smack in the middle of a large section of urban wasteland. Riding across that inconspicuous field, I happened upon some unusual signs. They were not the ordinary “For Sale” or “This land slated for future development” signs, but a series of small, one-of-a-kind signs with people’s names spelled out. All of them were nailed neatly to a mature tree. Most of them appeared to be made of new or recently purchased lumber, and all were cut at the same angle on each end. Based on the newness of the wood and lack of weathering, they must have been recently tacked to the tree. They reminded me of those handmade, weather-beaten vintage directional and mileage signs that can be found in small towns out west, nailed to gray wooded posts. But the ones I saw in that field were not mileage or directional signs pointing the way to the next burg and beyond. The assorted signs, with various colored letters hand-painted on them, seemed to be some sort of tribute to the named individuals. Perhaps they were attached to that tree as a makeshift shrine, or as a special tribute to people who may have lost their lives in a distant war or to a senseless act of urban violence. Or maybe they are a small acknowledgement of sorts to people that have made a difference in the life of the creator of those signs. 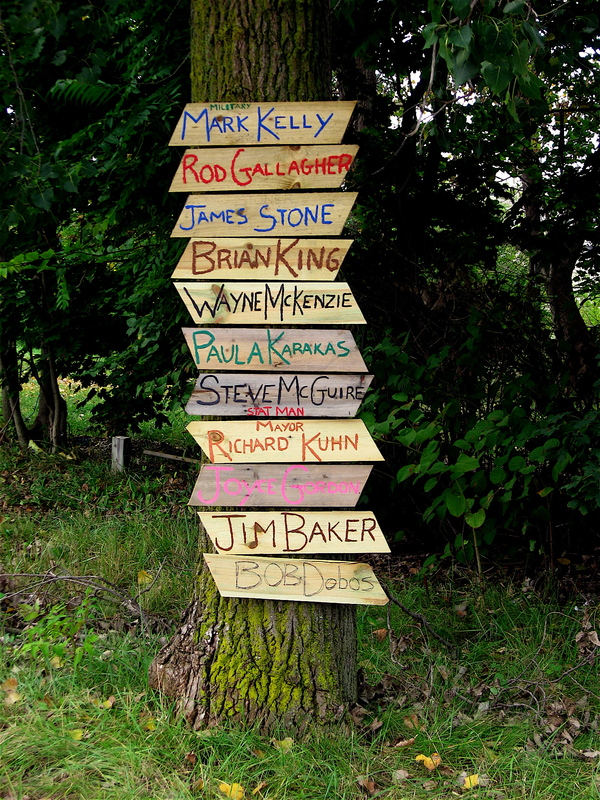 Whatever the names represent, it seems someone took a great deal of time and immense pride to hand-paint the names found on these mysterious signs and evenly stack and nail them to that tree in an unassuming, secluded field in Detroit.